Here in Ontario it's cantaloupe season! It goes from mid-August to mid-September and I wish it was longer because the locally grown "loupes" are far sweeter than what we get from California because they are picked at a much riper stage. How can you tell if a cantaloupe is ready? According to Ontario cantaloupe farmer Bill Nightingale they are best when "the tip of the melon is orange and gummy". I have my own tap, squeeze and shake routine to tell if it's ripe but I've had mixed results with it so maybe I'll start following Bill's advice. Considering cantaloupes are at their finest this time of year I wanted to pass along a super easy-to-make sweet tasting dessert that’s fit for you, me, couch potatoes, Olympic athletes...you know...everyone! I call it Cantaloupe Blueberry Bliss! 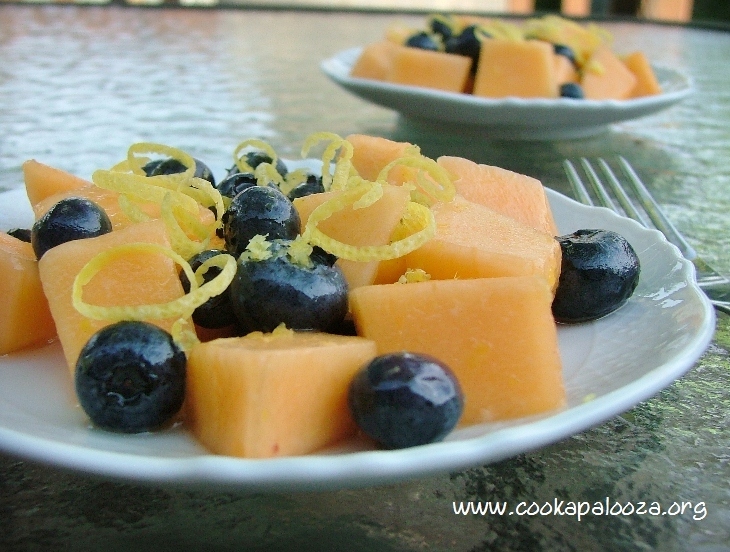 To make it you toss nutrient rich cantaloupe with fresh blueberries (nature's antioxidant super fruit) and drizzle it with a mixture of honey, lemon juice and lemon zest. How easy is that? You can eat it right away but it's even better if you give it 10 to 15 of minutes flavor combining time! Your reward...an incredibly sweet bowl of fresh summer fruit! I was tempted to top this with a scoop of vanilla ice cream but then I thought why ruin a naturally sweet tasting dessert with a scoop of fat that will just slow us (and the Olympic athletes) down. Recipe Inspiration: Locally grown "loupes"
Double the recipe for a week's worth of this healthy summer dessert! In a large bowl, whisk together honey, lemon juice and lemon zest. 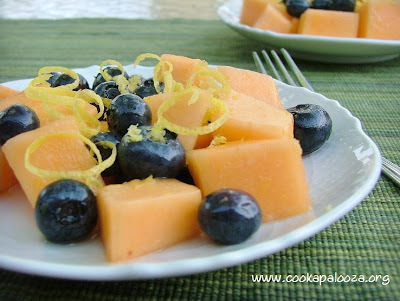 Add cantaloupe cubes and blueberries. Toss honey mixture with cantaloupe and blueberries. Let sit for 10 minutes before serving.